Of late I have been bitten by the fish keeping bug (or should that be water keeping?) 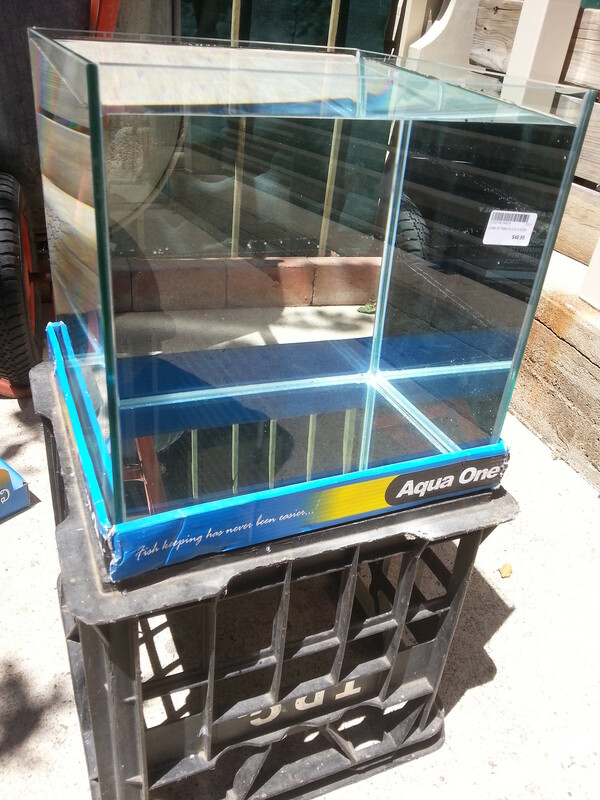 and have started a few freshwater tanks. That was until my LFS (local fish store) started getting ready to start stocking marine fish and related equipment. Well boy did that hit me hard! I present to you my first attempt at a marine aquarium, first pico reef, and my first DIY aquarium related project... Well, a SketchUp model and a photo of the cube tank filled with water (to test if it held water, which it did). The tank is an AquaOne Cube 30 (30cm x 30cm x 30cm or 11.8" x 11.8" x 11.8") and is all glass. Un-modded it holds around 27 litres (or 7.13 U.S. gallons) and I expect the final volume of the DT once modded to be 18.2 litres (4.8 gallons). The rear partitioning is going to be black 4.5mm acrylic and will hopefully be laser cut by Ponoko. It'll be setup to have either the heater or filter floss in the first compartment, a little in-tank protein skimmer in the second compartment, Chemi-pure and Purigen in the media racks in the last compartment, with the heater sitting in the return channel on the far right (if the heater isn't already in the first compartment) along with the return pump. Along with some corals, but as I'm fresh off the boat in the world of saltwater I have no idea (ask me about freshwater and I can at least tread water xD;;) so suggestions/recommendations are most and whole heartedly welcome.